Renovation mistakes can be costly, causing damage to your property and even decreasing its value in the long term. Before you start renovating your house, it is therefore important to understand how your home is built and check that ‘repairs’ do not actually cause more damage. In a bid to spare you from such destruction, we have collated advice from experts in the care and restoration of old homes, to help you avoid making the mistakes that many a well-intentioned renovator has made before you. Want to get it right first time? Check out our expert guide to how to renovate a house. Find tips on choosing new timber windows for your home. Most retrofit damp-proof courses (DPCs) in houses pre-dating around 1920 are not only unnecessary, but also damaging to old buildings. DPCs combat rising dampness, which is rarer than commonly supposed. It is the upward movement of moisture from below the ground through a wall (or floor) by capillary action. Moisture can rise to 900mm or more in walls, and salt deposits generally form a horizontal tidemark, with discoloration below. DPCs were increasingly inserted into new walls from the 1870s and are standard in modern construction. However, a DPC does not need to be installed in an older wall because they were designed to control dampness by being allowed to ‘breathe’, which was achieved with the use of vapour-permeable materials, including lime mortar. Excessive dampness occurs when attempts are made to seal such walls. Rising damp is widely misdiagnosed on the basis of high electrical moisture-meter readings alone. Elevated readings occur not infrequently in old buildings that are virtually dry, due to salt deposition from evaporation, or which suffer from another problem altogether, such as penetration from rain splash. Challenge any recommendation you believe is questionable on your renovation. If necessary, seek a second opinion in writing from an independent chartered surveyor or consultant (not contractor). Too late for preventative measures? Find out how to deal with damp and rot in our specialist guide. This trend is normally historically inappropriate and may cause harm, as most old doors are made of softwood that was originally painted. An exception to this is pre-18th-century oak doors that, where not lime-washed, were sometimes left unpainted. Sandblasting will spoil the surface of timber, while dipping in ‘acid baths’ can raise the grain and, by softening the glue, weaken joints. It is generally inadvisable to apply linseed oil, stain or varnish to unpainted oak doors. If it is thought vital, beeswax and turpentine can be applied to unpainted oak internally. Ensure a professional finish with our guide to painting doors. It may tempting to rip up old floorboards and install new flooring; resist that temptation. Squeaks may sometimes be silenced by puffing powdered graphite or talcum powder between boards that rub together, replacing missing or incorrect nails with cut flat floorboard nails, or using a nail punch to drive loose nails down. In other cases, it might be necessary to replace some of the nails with screws. Read our guide to repairing wooden floorboards for a squeak-free room. You might have been told that the beams in your old house are made from ships' timbers and be hunting around for a renovation match. In certain cases, it is known to be true that ships' timbers were used, but in many other instances, buildings are far from the sea and there is no evidence indicating that they incorporate reused timbers from ships. It is thought instead that the term refers to the quality of timber, just as we talk about ‘marine plywood’ today. As in the case of wood flooring, a good-quality wooden door is worth restoring, rather than throwing away. Wet rot can occur at the foot of a door when instead of the bottom rail being positioned just above the height of the threshold, it extends partly below it (as above). This can result in moisture from rain-splash collecting along the lower horizontal edges of the panels, leading to decay. Rain-splash generally affects areas up to 150 mm (6”) above ground level, so this zone should ideally be protected by the bottom rail. Where possible, reduce the threshold, or consider if there is scope to install a canopy or porch. Any areas suffering from major rot can be repaired by a good joiner and, where it is in keeping with the character of the property, the wood could also be painted to provide better protection from the elements. Remember, of course, that alterations may require consent from your local council if the building is listed. Read more about repairing internal doors in our guide. There are 19th-century housekeeping manuals that refer to sour (unpasteurised) milk applied sparingly with a rag as a cleaning agent for stone floors. It can impart a soft sheen and a degree of protection to the surface of a fine-grained stone with an established patina, but can also produce a dull milky stain on absorbent or damp stone. It is important, therefore, to test a small area first. Whether you should repair or re-slate an old roof depends on the extent of deterioration to the existing slates. Consider re-slating when repairs are no longer cost-effective – this is typically after one-fifth of the slates have been renewed. The condition of gutters and ancillary items, such as flashings, will also influence the course of action. Costs for re-tiling or re-slating vary greatly; a whole range of factors impact, including the condition of supporting laths, type of slate or tiles, and where you live in the UK. For major work, always obtain three quotations before committing. If you're looking for more specific guidance, or want to know where to find a reputable roofer, browse our guide to how to repair an old roof. If your old sash window jams, don't give up – but be gentle! Avoid forcing a sash to move, because this often causes damage. Sashes sometimes stick, jam or fail to move fully for various reasons. These include: broken cords; paint accumulation requiring removal, not only from running surfaces, but also pulleys; or a poorly positioned or distorted bead guiding a sash, which is easily resolved. In other cases, rubbing beeswax, candle wax or soap along sash edges makes opening and closing easier. Seasonal binding through humidity-induced swelling should be tolerated, unless it indicates that redecoration is needed. Our expert guide focuses on how to restore sash windows and will help you avoid irreversible renovation errors. Where active decay exists, the first priority is to eliminate causes of dampness and promote drying. Chemical treatments are frequently unnecessary and should only be used judiciously where justified as a secondary measure; for example, when it is hard to cut moisture levels sufficiently. Unfortunately, many roof timbers are sprayed with chemicals as a substitute for promoting drying, or as a general precaution for extinct or non-existent outbreaks, merely to obtain a guarantee. This happens particularly during property transactions. Repeated treatments every time a house changes hands can lead to the build-up of chemical cocktails that are not only potentially harmful to occupants, but kill spiders, which are natural predators of beetles. Unless decay is very serious, any timbers affected by beetle holes may be vacuumed or brushed down after measures have been taken to address the cause of an active infestation – though take care not to remove any medieval smoke blackening or evidence of early decoration that is of archaeological value. Degraded surface material should not be removed (‘defrassed’) without good reason, as it can result in significant damage. It may seem like a good time-saving option, but resist liming wood with ordinary bagged lime. Also watch out for incorrect application: coats being applied excessively thickly, inadequate dampening down before lime-washing, or drying out too rapidly. Good lime-wash applied properly to a suitable substrate should not rub off readily onto clothes. It’s eminently sensible to take some time to ensure that your brickwork is repointed with care. This is a common remedial task that is fairly straightforward, although unfortunately often badly executed. Repointing involves taking out and replacing the mortar (‘pointing’) from the face of a masonry joint. Unsatisfactory repointing can not only be visually disturbing, but harm the fabric that it’s intended to protect. Undertaken sensibly, though, repointing will help exclude the weather and extend the life of your masonry. The aim should be to match the profile of the existing pointing (unless, of course, inappropriate repointing has taken place previously). Old pointing is often best observed in sheltered areas, such as under eaves. A flush or nearly flush finish will often be suitable, unless a specialised form of pointing exists. Avoid the frequent mistake of making the new joints in your brickwork too thick. Sometimes there may be a case aesthetically for pressing the mortar back where bricks have heavily eroded edges and the joints would otherwise appear excessively wide. This technique can also assist you when blending in localised (or ‘patch’) pointing with areas where the existing mortar remains undisturbed. Repair old brickwork effectively in our informative, how to guide. Older buildings are frequently upgraded for improved energy efficiency, but many materials and methods suitable for mainstream buildings built after around 1919 are unsuitable for earlier, traditionally constructed properties. The risk to buildings involves not only worsening their appearance or losing attractive features, but hastening the deterioration of the fabric. Old buildings might become warmer but damper – seriously increasing mould growth and harming the health of occupants with conditions such as asthma. Such problems arise, for instance, where impervious wall insulation is used instead of products that allow the masonry to ‘breathe’. Similarly, over-zealous attempts to cut ventilation prevent adequate removal of ‘structural’ moisture from the breathing fabric, causing dampness. SPAB is leading research into ways of balancing the needs of building conservation with those of energy conservation. It has also helped found the Sustainable Traditional Buildings Alliance (STBA), which has produced a ‘guidance wheel’ for a range of retrofit measures and allows you to assess their advantages, risks and possible interactions. This is available free at responsible-retrofit.org/wheel. Where major thermal upgrades are planned to an old building, it is generally advisable to employ a suitably qualified consultant. Read our article on making an old home more energy efficient for more guidance. This is generally inadvisable. Paints and colourless water-repellent solutions may exacerbate deterioration by trapping moisture in the brickwork. Moisture can also be forced to travel greater distances to escape, therefore increasing the mobilisation of damaging soluble salts. Notwithstanding this, where a render has previously been stripped from brickwork, it might be sensible to replace it to protect the bricks against the inclement weather. The application of a new render or lead cladding over previously unprotected brickwork may also be prudent in certain circumstances; for example, to protect the inside face of a parapet wall suffering from rainwater saturation. It is rarely a good idea to insert a damp-proof membrane (DPM) beneath an old stone floor that pre-dates about 1919, because floors that are older than this must usually be allowed to ‘breathe’. Laying a plastic DPM on a new concrete subfloor can, by restricting evaporation, displace moisture into the base of a previously dry adjacent wall, causing dampness there. Instead, if a floor is genuinely damp, aim to address the cause – for instance, by removing impermeable rubber-backed carpets, improving site drainage, or controlling levels of condensation in the house. Allow time for the floor to dry out once the causes have been addressed. Residual salt deposits can be brushed off or, where serious, possibly poulticed out by a specialist. Looking on tips for restoring flooring effectively? 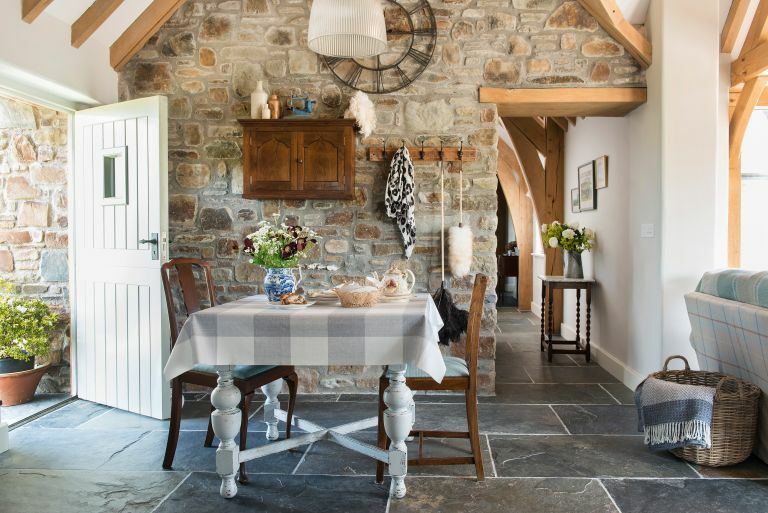 Browse our guide to how to maintain and repair old stone floors and get it right first time. Only cut out and replace bricks that have deteriorated seriously. Exact replication is very difficult, but there are a number of good suppliers producing new handmade bricks at reasonable prices. Replacement bricks should match the existing ones as closely as possible in size, colour, texture and durability. They should also be laid in the same way and have a matching bond. It is better to leave replacement bricks to blend in naturally over time than to try and tone them down artificially. Be wary about using second-hand bricks. Salvaged ones may be under-fired and unsuitable for external work, or are sometimes damaged, stained or painted. Occasionally, brick may be reused from another part of the same building – but then, only with considerable discretion. Original, traditional plasterwork contributes to the aesthetics of an old building, but also allows for a degree of flexibility and breathability that is so important in a period home, with old brick, stone and ancient wattle and daub walls relying on moisture to being able to evaporate through them, which in turn helps to prevent damp and condensation. Use our guide to using plaster in an old home to get yours right.